Earn 218 - 295 points upon purchasing this product. Use 2175 - 2950 points to purchase this product! 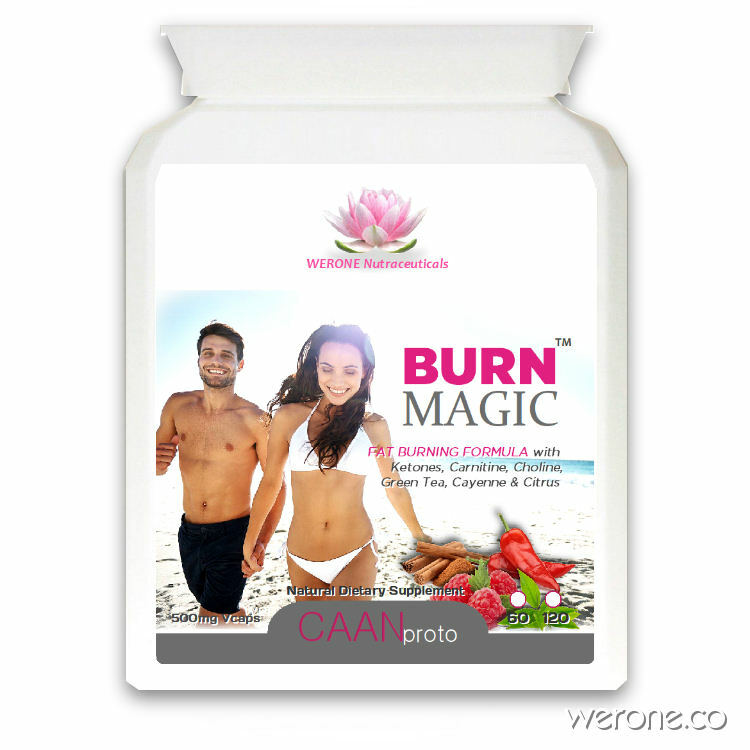 Whether you’re dreaming of a perfect bikini beach body or just want to shed those final stubborn pounds, BURN Magic™ weight loss capsules are the perfect training partner to maximise your fat burning efforts quickly and safely. Expertly formulated using a blend of powerful and naturally derived fat loss ingredients, and proven to increase energy levels, boost metabolism, reduce fatigue, boost mood and optimise fat burning potential, they are sure to give your weight loss goals that all-important push. Researchers have found that a combination of carnitine, choline and caffeine has an effect on reducing fat mass similar to moderate exercise. We’ve also added extra metabolic herbs to increase the burn even more! [source]. Losing weight is not easy if you don’t have the right knowledge on how to achieve it efficiently, seeing early results can also be very encouraging to your resolve, which is why we’ve included some resources below to help you back up BURN Magic™ with some lifestyle hacks. To understand how to make early gains with BURN Magic, it helps to understand the hormone insulin. Insulin is excreted into the blood by the pancreas whenever your blood sugars increase following eating carbohydrate and protein, and while it is there, the body WILL NOT burn any stored fat. In fact, it’s in the process of storing the sugars as fats, so finding ways to not activate insulin is a major key to weight loss. If you can combine this approach with BURN Magic™ then you have a team effort going on which will give you early gains within the first week, which will then encourage you to up your efforts a little more. There’s another trick you can employ knowing about the functions of insulin. Insulin is not released when you consume healthy saturated fats such as egg yolks, cheese, real butter, ghee, coconut oil and animal fats. An ultra low carb-high fat diet (LCHF), with moderate protein will ensure that your keep insulin levels low and fat burning high. Also includes citrus extracts for antioxidant benefits. For Her: Take 2 capsules in the morning before coffee/tea. For Him: Take 3 capsules in the morning before coffee/tea. 1. Cut all Bread, Pasta and Sugars, including fruit juices and snacks. Additionally, fruits, legumes, beans, pulses, quinoa and nuts will also thwart your efforts. 2. Increase Saturated fats such as Coconut Oil, Real Butter (Kerrygold or President), Ghee and free range Eggs. This will reduce cravings and help you adapt to fat-burning. [videos]. 3. Breakfast can consist of black coffee with frothed-in butter and coconut oil, 2-4 eggs and bacon at 1pm (increases the burn, provides extra choline). 4. Reduce eating window from 1pm to 7pm to activate fat burning mode and growth hormone (GH). High Fat Meal ideas here. 5. Drink black coffee and Green Teas through up until 3pm latest due to caffeine affecting quality of sleep. 6. Green blended Smoothy either late morning or afternoon with Kale, pea shoots, lemon, cinnamon and coconut oil. 7. Get to sleep earlier, 11pm latest. Use eye mask and avoid screens, cellphones and led lights in the bedroom. 8. Take apple cider vinegar in filtered warm water 30 mins before a meal, keep well hydrated all day, you will need a mineral supplement if drinking a lot of water. 9. Doing a few minutes of high energy movements before eating will increase fat burning after eating. [videos]. 10. If you’ve consumed a lot of grains, it’s very likely you will have a damaged gut lining which will need healing. Consuming Bovine, Colostrum and Glutamine/HUG Drink or Capsules.